In blender, place tomatoes, 1 cup of the broth, bouillon and garlic; cover and blend at low speed until smooth. In 4-quart Dutch oven, heat oil over medium-high heat. Cook onion in oil until tender, stirring constantly. Stir in rice; cook 1 to 2 minutes, stirring constantly, just until it begins to turn golden. Carefully stir in tomato mixture. Cook 1 minute or until mixture starts to bubble. Stir in remaining broth, parsley sprigs, chiles and salt. Cover and cook over medium heat 15 minutes, stirring occasionally. 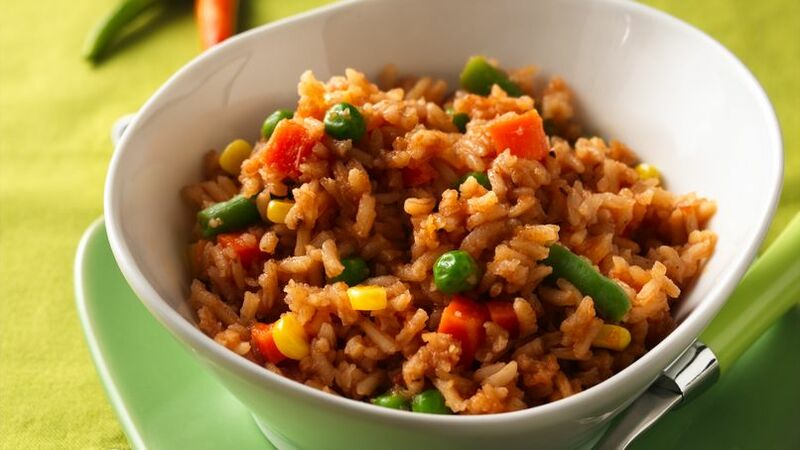 Stir in frozen vegetables; cook 6 minutes, stirring occasionally, until vegetables are tender and liquid is absorbed. Remove parsley sprigs.